Windows / Mac / Flash / HTML5 / Re: Any tips or ideas on my project? Well, it's a good start! Why not just let the player tap anywhere on the screen to turn the character instead of a button? One easy thing to improve the overall "juicyness" is to use the "grow" block while turning the character instead of switching the animation. "Grow actor to -100 w 100 h in 0.25 sec normal in/out". "Grow actor to 100 w 100 h in 0.25 sec normal in/out"
The overall effect is paper mario style. By the way just implementing the audio will improve the game a lot! You can use bfxr to make simple sound effects. This title screen is amazing, congrats! Hi greg, how's it going? While the inspiration is definitely there, I think the two games are basically different. Yes, you can shoot monkeys but you can't move them as in your game (they are not clones). You can jump on their dead bodies over the spikes, but is not the single mechanics: you can also shoot and squeeze them in order to make arrows that you can use later to shoot the banana (in order to move it, if unreachable) or to climb a wall like a ladder (gif). 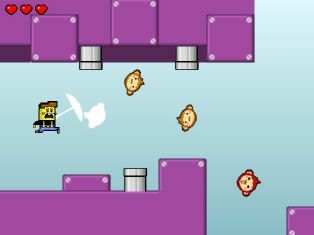 The dead body mechanics over spikes is something that many user did with this theme and have done in the past, like Super Rude Bear Resurrection. About the "monkey theme" I used this because I had some old assets that I created a while back for another contest (the pewdiepie's one), so I decided to start from there in order to save time. Monkeys also were perfect to fit my idea of a videogame "documentary" with a voiceover. That being said, I hope to had not caused any trouble. Nature is Harsh is my entry for Ludum Dare 43, theme "Sacrifices must be made". Ludum Dare is amazing as always, this is currently my fourth Ludum Dare game released! Welcome to "Nature is Harsh", the first video documentary that meets a (sadistic) videogame! Control Mama Monkey and try to get the beloved Banana... see what she can do in order to get this precious fruit! 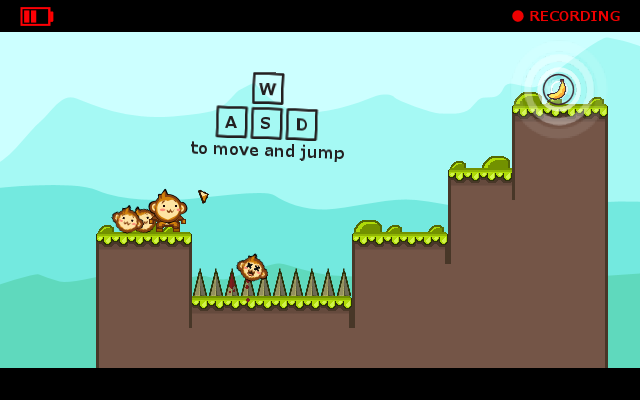 Sacrifice baby monkeys, throw them like arrows in the map and try to solve puzzles along the way. Nature is Harsh, you will believe me! - W,A,S,D to move and jump, R to reset. - Hold "W" for higher jump. - Mouse click to shoot monkeys. - Jump on a monkey to create a monkey-arrow. - You can jump on arrows like a ladder. iPhone / iPad / Android / Re: Castle Pals, June 28th on iOS! Where did you read that? Could you link it? Windows / Mac / Flash / HTML5 / Re: Plug Me on Steam! VERSION 1.1 is now live on Steam! - Now Evinrude will be on stage with you if you use its help! - Fixed the "super jump" glitch. - Added an option to disable the helping system. - Resized a bit the Boss collision boxes. - Added a little celebration when you finish a world. - Added Deathless achievement for both normal and hard mode. - Reset deaths will now reset deaths, batteries and lock levels but not your timer medals (Steam achievement will be not affected by the reset). - Now you need to confirm if you want to reset data from normal or hard mode. I don't know, maybe you're not using windows to test? If you are using flash you'll got for sure more lagging scenes... I didn't have this problem with windows builds. I'm using image API just for HUDs and nothing else. Windows / Mac / Flash / HTML5 / Plug Me on Steam! Plug Me is a tricky puzzle platform where the timer is a physical object in the game world! The city of Plug Me is falling off, and to save it you must get from one side of the level to the plug at the end, in order to recharge the loading bar. Plugman is the only one able to recharge this massive green bar that goes across the middle of the screen and quickly runs out of power. You are able to walk on the green parts of this bar as a platform, but you must be careful not to fall off as the power is drained. Thanks to the fast respawn and the help of both Evinrude (wich will remove one of the obstacles after you die too many times) and the Death streak mechanic (that will slow down the bar), the challenge will be constantly balanced! 50+ Levels In 5 Different Worlds. Collectable Batteries and Timer Medals. Help System After Certain Amount Of Deaths. I'm so glad I finally did it after 7 months of hard work! If you want you can see the DevLog here! Please, review the game on Steam if you bought it, this would be really appreciated! Hi guys and Happy Easter! Plug Me has a date! The 5th of April it will be available on the Steam Store! You can check the Steam Page and see the trailer and the wishlist. The Plug Me Steam page is ready, and the game will be released soon in April! Stay tuned for the exact release date! Very good game, nice job! I liked the way the hair and dress change to the right direction even if you turn the character both left or right. As other said some effects seems to be a little out of place (the jumping sound and the "boing"). The story is intruiguing, so I'll keep an eye on this thread for future updates!